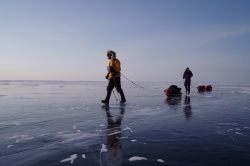 ​A three-man, British expedition team has set a new speed record for an unsupported crossing the world's largest (by volume) freshwater lake, Siberia's Lake Baikal. Scott Gilmour, Michael Stevenson and Rob Trigwell covered a distance of around 640km (397 miles) in 12 days, 21 hours and 13 minutes, finishing just after 6pm GMT on Tuesday 13 March. "I'm totally knackered, but very happy," said Gilmour, as he feasted on bacon and eggs at the finish. "I'm very relieved to be finally finished. I had a very tough last couple of days, but felt inspired and encouraged by my team mates, Mike and Rob, who helped me through. I'm just proud to have shared this experience with two great team-mates." "After five years of planning this trip, it's finally come off!" said an emotional Trigwell. "I'm extremely happy to have ticked this one off my list – finally." "Relief is my number one emotion," said Stevenson. "The terrain really saps you. It's so draining. I want to thank my two team mates, they're great guys. I can't wait to get home to see my kids. What's next? Maybe the South Pole!" They survived most of the trip with just one working stove, meaning every night one of them would stay up late melting water for the others, while their team-mates slept. They averaged four hours' sleep per night over the 12 days. Evidence of the new speed record crossing of Lake Baikal, a GPX route from the spot tracker, showing the whole route with times and dates, will be available shortly. Norway-based Briton Scott Gilmour, originally from the Middlesbrough region, is an adventurer, race director and photographer. Scott competes in and films the coldest and hardest races across the globe, and organises one of the most challenging endurance races in Europe, The Montane Spine Race. He is an ambassador for Montane and PNY Imaging. Michael Stevenson is a Wigan-based, recovering addict who took up running marathons and ultramarathons several years ago during his recovery. He's also a Mountain Rescue volunteer and youth worker, with four trips to cold regions under his belt before this one. Stevenson would like to thanks PHD for their support. Rob Trigwell, from Northampton, is a humanitarian worker whose vocation has taken him to Libya, Jordan, Bangladesh, Iraq, Philippines, South Sudan, Nepal, Myanmar and Ethiopia. When working for an NGO in Jordan, Trigwell won the country's first ever official triathlon. He's always had a background in the outdoors and started his cold weather pursuits in Arctic Sweden in 2016. New Lake Baikal speed record: 12 days, 21 hours and 13 minutes, set by Scott Gilmour, Michael Stevenson and Rob Trigwell, in March 2018. Previous record: 13 days, 16 hours, set in 2010 by Kevin Vallely and Ray Zahab. Distance: approximately 640km (but actual distance is longer as they had to skirt around sections of ice and other obstacles). Temperatures: lowest -35°C, highest -8°C. Longest day: their final day was over 78km (48 miles). Lake Baikal: located in southern Siberia, UNESCO World Heritage-listed Lake Baikal is the largest freshwater lake by volume in the world and thought to contain 22–23 per cent of Earth's fresh surface water – more water than the North American Great Lakes combined. It is also considered the world's deepest lake.